LEXINGTON, Ky. (May 13, 2010) − The University Press of Kentucky (UPK) book "Keeneland's Ted Bassett: My Life" by James E. "Ted" Bassett III and Bill Mooney has been awarded the fourth annual Dr. Tony Ryan Book Award by Lexington's Castleton Lyons farms and Thoroughbred Times. The award, named for the founder of Castleton Lyons, is presented annually to the best book published about the thoroughbred industry. "Keeneland's Ted Bassett: My Life," written by Bassett, former president, chairman of the board and trustee of Keeneland, and the two-time Eclipse Award-winning journalist Bill Mooney, presents readers with a comprehensive autobiography of the man behind the racetrack, exploring all aspects of his life both on and off the track. After serving as a member of the U.S. Marine Corps in the Pacific theater during World War II and as the head of the Kentucky State Police during the tumultuous 1960s, Bassett began his career in the horse industry, pushing Keeneland to the forefront of the racing business. He has served as Keeneland's president, chairman of the board and trustee, and was also president of Breeders' Cup Limited. The book's co-author, Bill Mooney, has covered racing for the New York Times, the Thoroughbred Record and The Blood-Horse, and is currently a contributing editor for Thoroughbred Times. He is also the author of The Complete Encyclopedia of Horse Racing, a comprehensive reference book about the "Sport of Kings." The award's three finalists participated in a book signing on April 23 at Keeneland Race Course. Later in the evening, during an invitation-only reception, the award was presented with a $10,000 cash prize. The runners up, "Beyond the Homestretch: What I've Learned From Saving Racehorses," by Lynn Reardon, and "The Kentucky Derby Vault: A History of the Run for the Roses," by Andrew Plattner, were each awarded $1,000 prizes. To watch video of all the writers talking about their books, visit the Thoroughbred Times at www.thoroughbredtimes.com/competitions/thoroughbred-times-castleton-lyons-book-award.aspx. A panel of three judges was responsible for awarding the Dr. Tony Ryan Book Award. The panel consisted of Rudolph Valier Alvarado, the 2008 winner of the same award for "The Untold Story of Joe Hernandez: The Voice of Santa Anita"; Kay Coyte, an editor with the Washington Post; and Mary Simon, contributing editor of Thoroughbred Times. 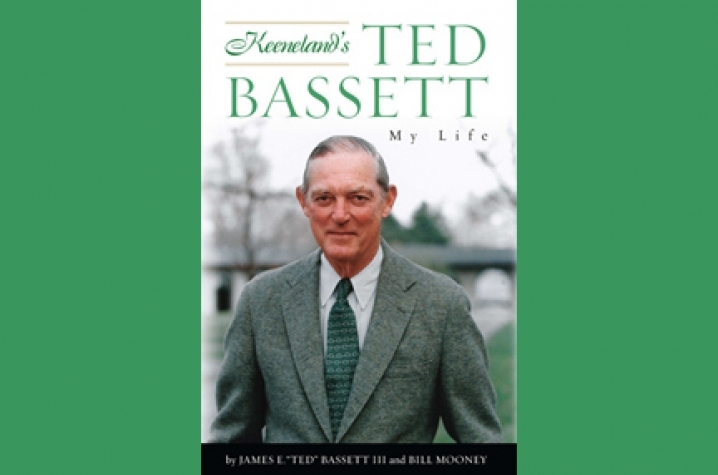 Simon described "Keeneland's Ted Bassett" as "one of those rare racing autobiographies that transcends the sport in which it is largely based. Beautifully written, with humor and endearing self-deprecation, it captured me right out of the gate and kept me riveted around the turn, down the stretch, and across the finish line." To find out more about the book, check out UPK's DarkHorse video podcast with Bassett and Mooney at www.kentuckypress.com/newsite/pages/episode8.html.